I am Rachana Kaur Gothra, a 2015 Teach For India Fellow. 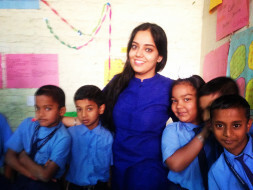 Teach For India is a two-year full time commitment where young college graduates and working professional are placed in under resourced low-income schools to understand and solve the problem of educational inequity in our nation. I teach a class of 30 bright and ambitious fifth graders in People’s Education Society (PES Yerwada), it's a private school which has classes running from grades I to X. I believe that each child in my classroom will achieve great things as I see them engaging and pushing the bar for excellence every single day in the classroom despite the limitations. I believe where a child comes from should not determine where a person goes as long as we are able to provide them the right opportunities to grow. To make my children ready for the real world, I need your ideas and support. WHY DO I WANT TO FUNDRAISE? I believe every child is unique and this element must be celebrated and nurtured. I am striving to develop a space where I am able to provide each child in my class with the best of opportunities so that they can grow up to be self-aware, passionate and driven change-makers of this nation. To sponsor children who are dropping out of school due to their inability to pay the fees. For organizing educational field trips. This will only be possible with the ideas and support you provide me in my initiative. Your contribution will go on a long way in defining the future of these children. If you want to help me in any way, please feel free to write to me at ’rachana.kg2015@teachforindia.org' and I will get back to you at the earliest. If you stay in Pune, please volunteer in my classroom, give me ideas/suggestions to improve the school, help the children learn, teach them a few new things and take back a ton of learning and experiences. You can also help by passing this message with your close friends, family or colleagues and help me in my initiative. Will I know how my money is used? You will be kept updated on the activities done in the class on a weekly basis via mail.